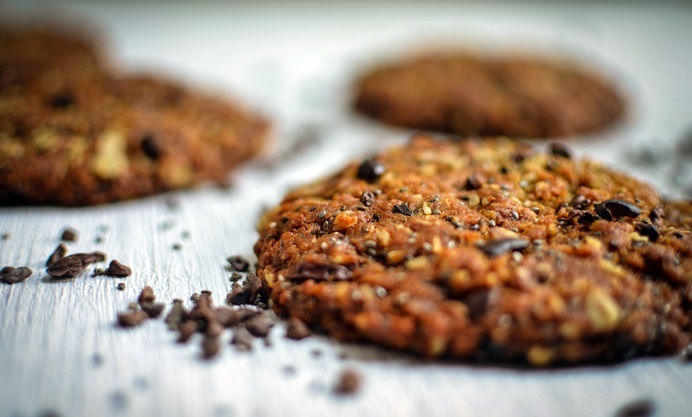 Urvashi's cacao nib cookie recipe is the ideal snack for when you need a sweet pick-me-up. 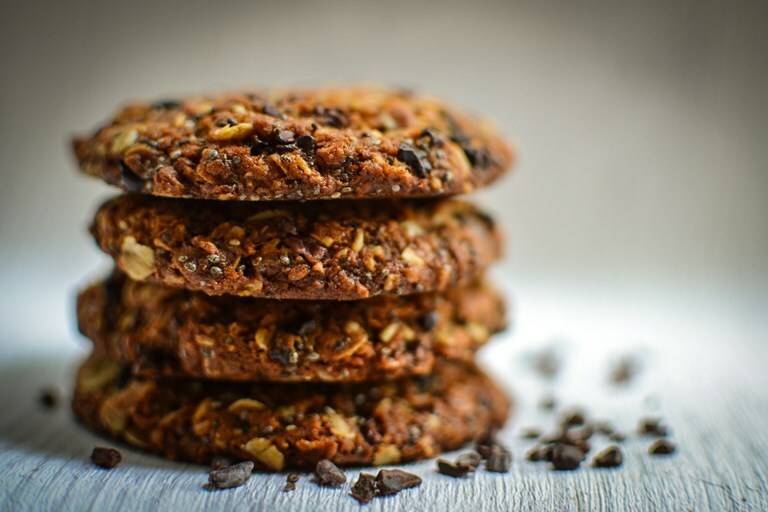 A combination of crunchy cacao nibs and chia seeds will help take some of the guilt out of these delicious flapjack cookies. The 3pm sugar dip. Do you get this? That time of day when you neeeeed something sweet to take you through the afternoon? I do. I have a cup of tea and then I need a little something to munch on the side. In fact it’s not just the 3pm dip. It’s also 10am. And then maybe around 9pm. These are the times when the munchies set in. These are the times when I go rummaging to the back of that cupboard where the shop-bought biscuits hide. Or pop down to the staff canteen where the only selection of treats are chocolate bars. The really awful sweet ones that make me feel regret with every mouthful. My mother is the same. Maybe it’s an Indian thing? Culturally we never offer tea to guests or indeed each other without bringing a little nibble on the side. Yes that’s it. That’s exactly where this habit comes from! Generations of women in my family have been conditioning me into this behaviour. It’s all their fault and I can do nothing except go with the flow. Right? Well I have decided that I need to resurrect another family tradition. When I was little there would be weekends when all my aunts would descend on my mum’s kitchen. It was the biggest kitchen and every space would be taken up with making batches of different snacks. Each aunt had a speciality and would take the lead when it came to making her signature snack. It’s a wonderful tradition and the days were filled with gossip and giggles. Sadly the snacks were generally fried or laden with sugar. So rather than make some of the traditional snacks I’ve been making slightly healthier ones. Snacks I can carry easily to work or give my girls when they come home from school. Flapjacks are one of my favourites. Each batch can be different and use up whatever you have leftover in the cupboard. Instead of chocolate I have used cacao nibs. They don’t melt when baking and give a nice chocolatey crunch in this soft cookie version. You could use nuts instead. I’ve also used chia seeds to make these a bit more filling. You can substitute these out with other seeds like linseed, pumpkin, sunflower or sesame. So many combinations and so easy to make. They could be ready to eat before the aunts have even put the masala tea on!